This irreverent and humerous card game takes place during the French Revolution. Players represent rival guillotine operators vying for the best collection of noble heads over three rounds. Each round, twelve nobles are lined up for the guillotine. The nobles are worth varying points, depending on their notoriety. During your turn, you play action cards to change the order of the line so you can collect the best nobles. The player with the most points at the end of the game wins. This is a extremely fun little card game I would recommend to anyone, it is easy to pick up and quick to play. The artwork is well done and the action cards full of good humour. 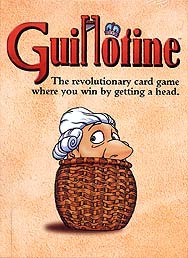 The game is set during the French revolution with players competing to collect the most valuable heads of the Aristocracy. There are a few cards that provide negative points so the action cards help to shake up the order of the cards or effect other players turns. It is played over 3 Days (rounds) each with 12 Nobles in the line up for the Guillotine, some of the Nobles have special powers when they are collected or when certain actions are taken so there is a lot of twists and turns to keep players interested. Always a Pleasure to play and a worthy addition to my collection. This is one of those games that I love anyone can learn it, and it is fun to play. The whole idea is to behead the villians and make your oppenents behead the heroes. You do this by playing cards which alter the order of the people in the line that are due to be beheaded making sure that when you have to pick up your victim it is the one you want. This is probably one of my favorite end of night games. Not too much thinking but lots of fun.